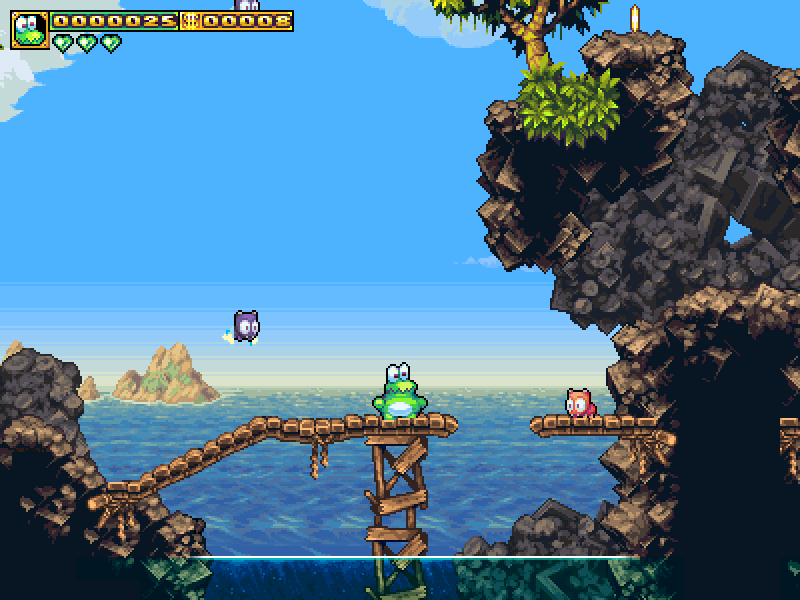 Frogatto is a new free source (but not art) 2d platform game released for GNU/Linux, Windows, MacOS and even iPhone ! Frogatto is now a fully playable, fun, classic adventure platformer with over thirty levels, version 1.0 representing the first stable version of the game. 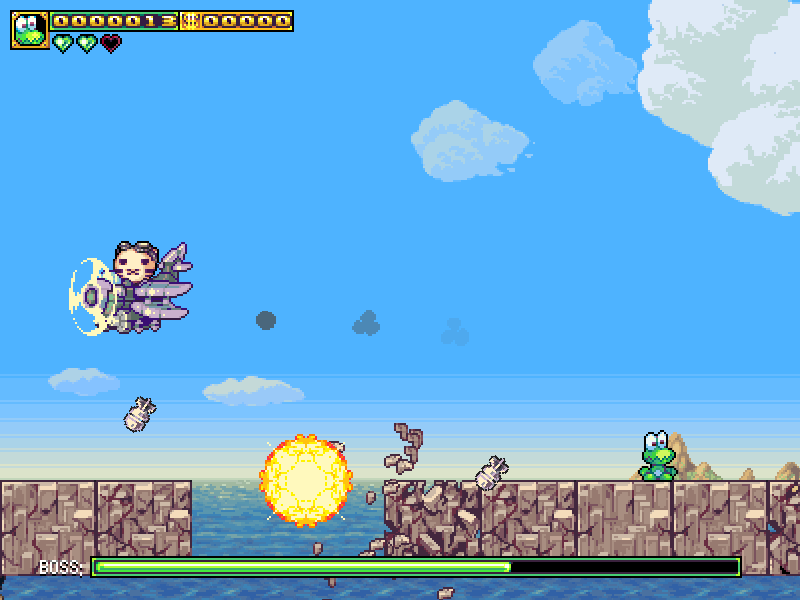 Frogatto is a “platformer” or “jump-and-run” videogame. 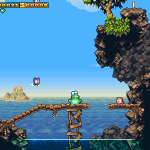 Like many older arcade/nintendo/sega titles, the world is viewed as a cross-section seen from the side, and your character walks and jumps between solid platforms, whilst avoiding being hurt by monsters. We’re not a clone of any specific game; although just by being a platformer, it’s impossible not to have something in common with games like mario or sonic. So we are trying to innovate a bit. Frogatto is also the protagonist’s name. It’s eponymous. Frogatto’s code, but only the code, is open-source. Open source means you can see (and reuse) the code we built the game from. This makes frogatto infinitely moddable (and fixable, and maintainable, unlike closed-source ‘moddable’ games which leave you permanently stuck with engine bugs or future incompatibilities). Even more importantly, this means you could take frogatto’s code and build your own 2d game out of it. We can help with advice on that – we’d love to see that happen. This also means we’re open to translations – at least, once we have code support for it. We’re not going to bother until after the game is released. The license on the code is the GPL; if you’re going to reuse our work, we insist you “pay it forward.” Our content, though, is not GPL – we’re reserving all rights to the art and music, because we want to be the only people who can sell it. Also, people have suggested a CC-Non-Commercial license for the content, but we’re not interested. That would expose us to the very real danger of someone releasing the game for free on a platform we’re trying to sell it on. Whether likely to happen or not, if it did happen, it would have a catastrophic effect on sales, so it’s too much of a risk for us. Those interested should note that some old pieces of our content have been completely open-sourced, and can be found at OpenGameArt.